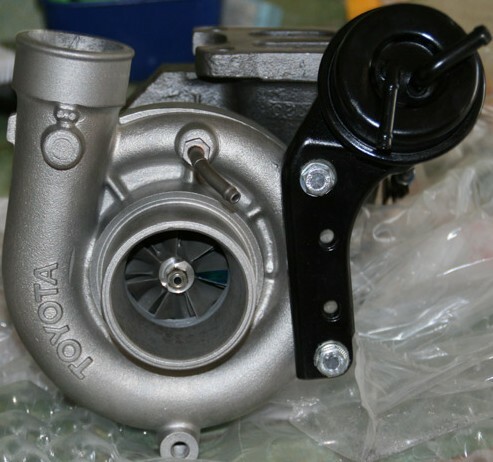 Tag Archive | "CT26 Turbo"
The CT20b is ceramic twin entry turbocharger that is one of the most sought after upgrades for the 3S-GTE engines in MR2’s and Celica’s, it came standard on all GEN III 3S-GTE motors and can usually be found from wreckers for around $800 used. The CT20b is designed by Toyota and manufactured by Hitachi which limits the amount of people who are able to work on them, If you are looking to rebuild a CT20b there is not much point unless you are doing a high flow as the re-builder will generally replace the ceramic wheel and shaft with steel ones, and by removing the lighter components you taking away what makes it spool faster. The CT20b has a working pressure of 11.9 – 16.7psi which is very similar to the CT26 but still higher, the main advantage of using a CT20b over the CT26 is that the CT26 has a steel shaft and wheel where are the CT20b uses ceramic. Due to a revised and more efficient compressor wheel the CT20B will spool slightly slower but has more top end gains and although the ceramic is lighter and spools faster it is severely weaker than steel. The CT20b will hold boost right through to red line where as the CT26 starts to drop off at about 5500rpm, Max boost on a CT20b is 18-19psi but that is well outside of the efficiency range of the turbo and being over its limits it increases the chance of breaking the wheel and snapping the shaft. The Fensport website actually publish that the series one of the CT20b all have the common problem that the turbine shaft is prone to cracking. The CT20b is rated at 400hp which is close to 280-300 rwhp so all in all it’s a excellent bolt on upgrade as 15-16 psi is approximately a 37 percent power increase over stock which is perfect for those who prefer a mildly worked street-able car. But if you are planning on doing some extensive upgrades like ECU and cams then I would not recommend it due to the fact that the CT20b technology is 15 – 20 years old now and if your going to pay near $800 you might as well get something a bit bigger. 48mm 62mm ?? ?? 59.8mm ?? ? ?